Small kitchens present specific storage challenges that can be solved with a little creativity. Having enough storage is vital for any kitchen, especially if you want one amply equipped for daily use. Convenience can be accommodated with these storage ideas tailored just for small spaces. A great solution for small kitchen storage issues are cubbies. Kitchen with tall ceilings are excellent places for cubbies or you may like a vertical row of cubbies beside the stove for easy access when cooking. Recessed cubbies are another option if you have a small kitchen. Add recessed cubby spaces along a galley style kitchen wall to provide storage that doesn't require enough space to open and close cabinet doors. With a cubby, oversized containers can slightly protrude, which makes the storage space more accommodating and adaptable. If you choose a wall space behind a door where large cabinets couldn't fit, recessed cubbies are an ideal solution to provide needed storage space. One of the best ways to save your counter top space is to get rid of the microwave by placing it in a cubby. Adding a series of cubbies underneath overhead cabinets can provide space for a microwave. Don't stop there - use cubbies for various small appliances. Place a toaster in one with a pull-out shelf for when you need to use it. A coffee maker could also go into a cubby and be easily accessed for daily use. 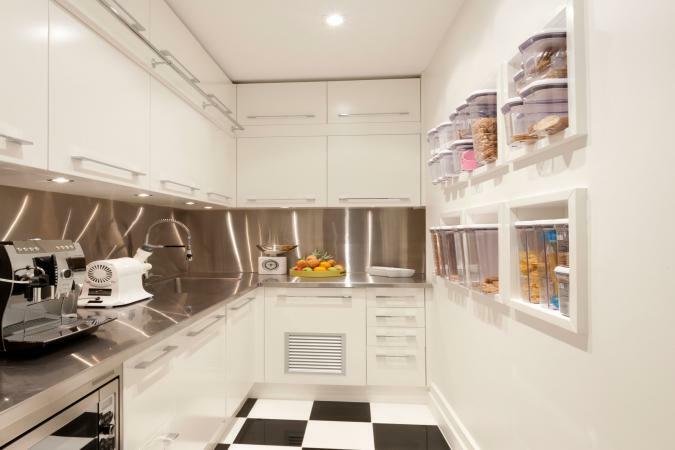 Using cubbies as a solution to storing your small appliances without sacrificing valuable counter space for food preparation may be just what you need to save space. Once you've added cubbies, you'll want to select containers to fill the cubbies so your kitchen utensils, and even foods, are within easy reach. Container Store: Choose your colors for smaller cubbies with these woven palm leaf containers. You'll pay around $9 each. Amazon: Clear plastic containers make it easy to see what's stored. Lids make it possible to stack in tall cubbies. A 12-pack is available for around $23. Ikea: Rattan baskets add a decorative flair to any cubbies with cut-out handles for easy pull out and retrieve. They cost about $13 each. Take advantage of backsplashes by using this valuable space for a pot and pan rack. This clever idea makes use of space that's often unused. 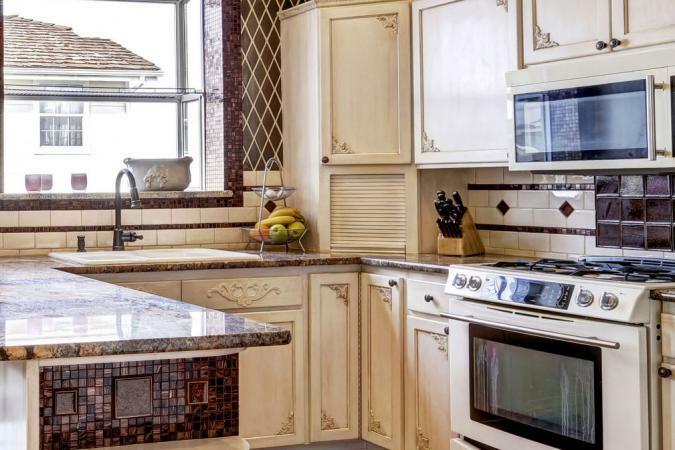 You can convert a backsplash very easily. Simply add a bar or rack above the backsplash underneath overhead cabinets. 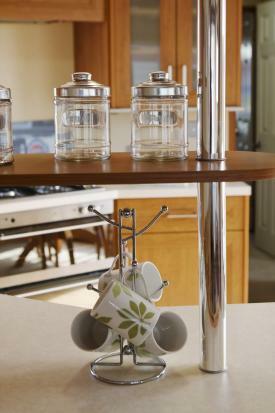 You can hang pots and pans as well as cooking utensils for easy reach storage. Bed, Bath & Beyond: This 32" L pot bar pot rack comes with four hooks. 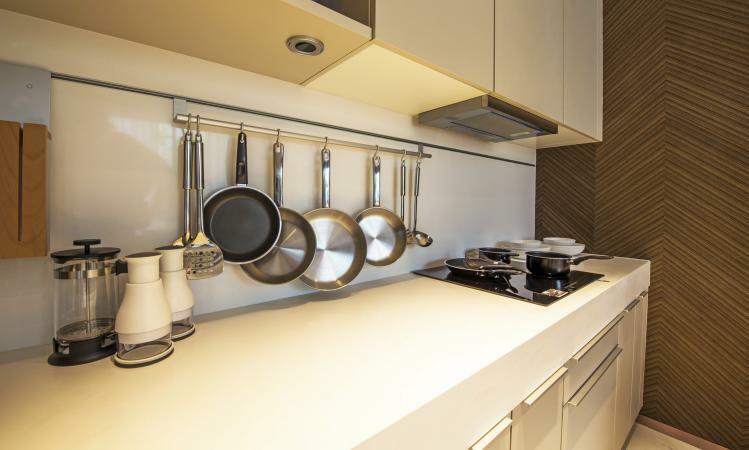 You can use more than one bar rack if you require more storage for your pots and pans and have a large backsplash area. It costs around $40. Wayfair: This 36" wall mounted pot rack has 8 hooks ready for your pots and pans. Expect to spend about $53. An appliance garage is an excellent solution for storing small appliances and utilizing a corner counter space. Select a corner that's convenient to the sink and store appliances, such as a coffee-maker, mixer, slow cooker, and other small appliances. One popular choice is a roll top style that simply lift up like a garage door to reveal the storage space. You may prefer a cabinet style door, but the roller style doesn't take up any additional space when opening and closing. If you have recently moved or renovated, consider downsizing your kitchen appliances so they all fit inside the garage. This way, you can place several appliances inside instead of a single larger one. This angled counter space utilizes the space with attractive stainless steel and wood vertical shelving. Various canisters of glass and stainless steel repeat the look. The stainless steel coffee mug tree completes the theme. Add a unit with several vertical shelves that goes all the way to the ceiling. Put your most often used items at the bottom, with decorative or less frequently used items at the top. Storage baskets and containers give a neat, organized look. Potted herbs break-up the shelving hard lines while providing fresh herbs for delicious meals. Choose canisters that repeat your kitchen décor theme. Most cooks and bakers love to use spices. This can present a storage challenge for small kitchens where space is a premium. 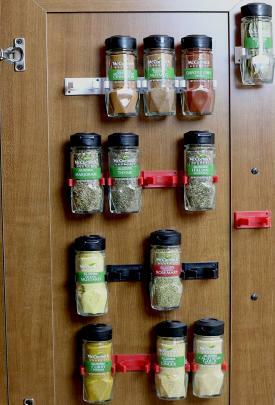 One of the creative ways to store spices is with spice clips attached to the inside of a cabinet door. You can purchase a spice clip rack or purchase individual spice clips. Most spice clips come with pre-applied double-sided foam tape. Simply peel and place on the inside of the designated cabinet door. Be sure you space the rows of spice clips far enough apart to accommodate larger spice bottles. One rule to assist in ease of use is to place the smallest containers at the top and the largest ones at the bottom. You can choose a simple spice rack that is designed to fit over a door to increase your storage space. If you have a pantry door or a door that leads outside or into another room, you can use this type of rack. Some of these racks also accommodate various sizes of jars as well as spice bottles with as many as 8-tier shelves. This could become one of your favorite storage solutions for a smaller kitchen. You can utilize this concept for other types of storage inside cabinet doors using either over the door designs or tape secured racks. These can accommodate garbage bag storage, cleaning supplies, sponges and various kitchen-related tools and utensils. 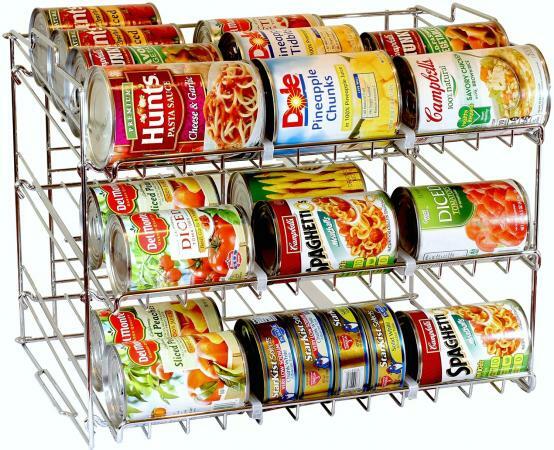 Stacking canned goods on top of each other isn't always an easy or desirable way to utilize cabinet storage space. Instead you may want to try a different storage tactic, such as a stackable can rack organizer. This type of storage allows you to use the first in first out usage to ensure excellent shelf life efficiency. You can organize like cans so you can quickly identify inventory needs when creating a shopping list. You can use this type of cabinet organizing for other items, such as pots and pans along with matching lids. An organizer rack for these kitchen tools can conserve space and make working in the kitchen more efficient. A two-tier pull out cookware organizer may be just what you need to organize all your cookware. There are some simple ways to have the necessary furniture and tools you need in a kitchen when working with a small space. Small table: A folding wall-mounted table is ideal for an eat-in kitchen space. Glass top table: A glass top table can give the illusion of a larger space. Round table: A small round table will take up less space than a square table. Take out extra leaves when you're not entertaining. Chairs: Reduce the size of chairs. Consider folding chairs for storing when not needed or bar stools that can be pushed below the table or a bar. Large appliances: Choose major appliances designed for apartments or small kitchens. Make sure the refrigerator doesn't stick out much further than the counters. Small appliances: When selecting small appliances keep space restrictions in mind and don't purchase large ones. Lighting: Go for several types of small light fixtures to provide ample lighting for kitchen tasks. 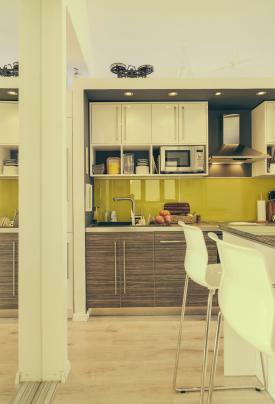 There are many creative solutions that effectively address the lack of natural space in small kitchens. Select the ones that can be helpful for your kitchen and you'll be cooking and baking with ease despite the lack of space.